Approximately 5 miles east of the Jordan River and .7 miles north of the Jabbok River lies the ancient ruins of Deir 'Alla in Jordan. Deir 'Alla suffered widespread destruction around the 13th-12th century B.C. and was rebuilt and continuously inhabited until the 5th century B.C. when it was destroyed by an earthquake. In March 1967, a team of archeologists led by Dr. Henk Franken discovered lettering on 119 fragments of plaster littering the floor of a large Bronze Age sanctuary in the earthquake's debris field. 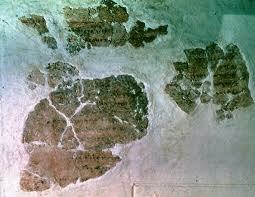 Painted in red and black ink, the recovered fragments formed an inscription that was written in Aramaic. In their reconstruction, archeologists believe that the inscription was in a long column with more than 50 lines. Despite the damaged and fragmentary nature of the inscription, archeologists have reconstructed enough to see that it mentions "Balaam son of Boer" three times in the first four lines, and it tells of a prophecy by Balaam foretelling of the destruction of his people. The best Dier 'Alla Inscription reconstruction can be seen here. Carbon dating places the Dier 'Alla Inscription in the period of 840-760 B.C. Balaam of Beor existed some 600 years or so earlier. Scholars, aware of this discrepancy, note that the inscription refers to the "Book of Balaam" which indicates the presence of a pre-existing manuscript or scroll; thus, the date of the material is certainly earlier. Other evidence attesting to the historical reality of Balaam of Beor is the geographical proximity of the Dier 'Alla Inscription to the biblical accounts of Balaam of Beor. The events of Numbers 22, 23 and 24 occurred in the plains of Moab near and east of the Jordan River and in the proximity of Jericho; Dier 'Alla was within twenty five miles of this area. Also attesting to the biblical record and its dating is the evidence of an earthquake at Dier 'Alla. The prophet Amos preached two years before an earthquake (Amos 1:1), and archeological evidence from Hazor attested to a severe earthquake during the mid 8th century B.C. Amos mentions Jeroboam II of Israel and Uzziah of Judah (Amos 1:1) which suggests the date around 760 B.C. The Dier 'Alla Inscription confirms the historical existence of Balaam of Beor who lived in the plains of Moab east of the Jordan river and appears to have been revered well after his existence. God instructed the Israelites to take full vengeance on the Midianites, and Balaam was killed with the kings of Midian (Num 31:8, 16; Josh 13:22; 24:9-10). God indicated who should be excluded from the assembly of the Lord (Deut 23:3-6; Neh 13:1-2). Balaam is portrayed as unrighteous (Mic 6:5; 2 Pet 2:15-16; Jude 1:11; Rev 2:14). 1. Dijkstra M, "Is Balaam Also Among the Prophets?" Journal of Biblical Literature, 114: 43-64, 1995. 2. Franken HJ, Excavations at Tell Deir Alla: the Late Bronze Age Sanctuary, Leuven / Louvain: Peeters (1992). 3. Shea WH, "The Inscribed Tablets From Tell Deir 'Alla", Andrews University Seminary Studies 27: 21-37; 97-119, 1989. 4. Wood BG, "Prophecy of Balaam Found in Jordan", Bible and Spade, 6: 121-24, 1977.